I've been wanting to write something about the proposed mosque at Ground Zero, but my emotions have been running so high that I needed to calm down and collect some thoughts. 9/11 was a horrific, brutal, cowardly attack on innocent people that was executed by zealots who gave the excuse that they were fulfilling God's will. I cannot believe that they were truly convinced of this motivation, but rather they were primarily intent on fulfilling their own evil desires. For anyone to suggest that the people of New York are intolerant because they object to the placement of a mosque and Islamic center right on the perimeter of Ground Zero is an ignorant and malicious excuse for political demagoguery. Are these politicians so obtuse or fearful that they cannot comprehend the insensitivity of placing an Islamic cultural center on the edge of this hallowed ground? Perhaps if they could be transported to that day to see it through the eyes of the people of New York they would understand. Or, perhaps not. Perhaps their only interest is to be admired by the world at the expense of the ordinary people who showed extraordinary courage, grit and bravery on that terrible sunny September day. Perhaps if they could sit with the families who sat through the nights waiting for word on loved ones who were never to come home. Or perhaps they could be with the firemen who were loading up with gear to go into those buildings as everyone else was coming out. 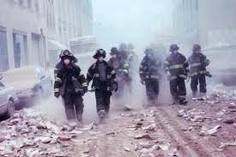 Or perhaps they could be with the EMTs who were racing to the towers to care for the wounded, the burned, the dazed, the shocked and who never came out again. Or they could stand with the priests who were granting absolution to groups of firemen as they stopped momentarily before going into the burning holocaust. Maybe they would understand if they had heard the mournful bagpipe day after day at the local parish as the rescuers were laid to rest. Or if they sat in the church to watch the honor guard process in with the fireman's helmet because it was all that remained of him and there was no body to bury. Those firemen, EMTs, police officers and others were the face of Christ that day. It was their Christian faith that imbued them with the spirit to live a life of sacrificial love. They were not raised to ask first about a person's religion or ethnicity. Their instinct was to care for others first and think about themselves later. To imply anything different about the loved ones they left behind and their neighbors and friends in New York is beyond disgraceful. Why is it that the ones who showed the care, the bravery, the generosity on that day and who continue to live with the pain, both physical and emotional, are now the ones who must defend themselves against charges of intolerance? As the editors at National Review have written, "...America's tolerance is a matter of record." There’s a tattoo, can you see?